Upon arriving in deepest Dalston (all young designers live in this district of east London) I ring the bell of a large factory building and after a few minutes a fit looking intern arrives slightly out of breath to the door. When I am lead up two sets of stairs, then downstairs, around a corner and down yet more stairs I see what took her so long. If any daring fashion thieves decided to plan a heist in this building in order to steal what may be be the most anticipated NEWGEN designer collection of the season, they wouldn't get far with it. In the lair of J.W Anderson, London's most talked about young designer at present, things are quiet and appear very organised. It is a week before the show, which takes place today within the now empty former legendary St Martins School of Art building on Charing Cross Road building "I didn't go there, so this is my way of being where creativity used to be," says Jonathan, as he is better known. It seems amazing that the Irish literature graduate who started out doing jewellery, followed by menswear before being persuaded into doing clothes for girls, has come so far so soon, but he is nothing if not ambitous. I can see his new collection (above) glistening and mutedly colourful on a rail in the corner. Stiff flared plaid skirts that appear to be Tweed, but turn out to be felted neoprene jostle with some slightly disturbing mid brown vinyl trousers and a matching V neck top and also fantastically hued bobbly fisherman-style knitwear. On the wall I spot a photograph of the Nineties most quirky supermodel, Kirsten Owen, with a very choppy asymmetric blonde bob. So far, so fashion. Then Jonathan plops himself down. He is buoyed by his current success, (sales quadrupled after the last show, American Vogue have featured him in six recent issues) yet is allowing the pressure to produce another hit collection propel him further down the path of creativity. "I am pushing my ideas as far as they can go. People didn't expect it last season [he means they didn't expect a show so chock full of new ideas] and I got attention. So I'm taking that to another level with this collection. Its difficult top crop up as new in London and stay new; it takes a lot of stamina. "I think we have overdosed on print, so I am using texture and shape to create a new form of decoration. Print from texture, I guess. I'm using pinstripe, quilting, the felted neoprenes and thick knits, and am working with car fabric manufacturers to develop padded fabrics. I am shuffling my vocabulary to make something the same but different; I guess my main message is the idea of monolithic shapes; you only need two pieces to make a look. An old shape meeting a new shape." He gestures to one wall, which has the looks for today's show drawn up; sure enough it all about two-piece looks. Jumper/skirt; trouser/top. 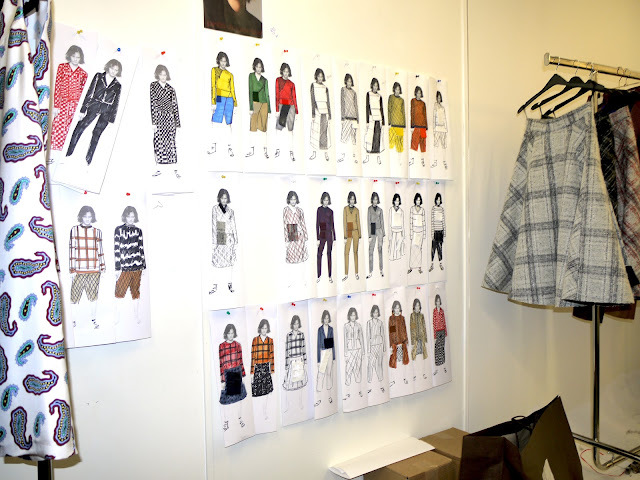 Colours are in single blocks of burgundy and beige, cream and red with plaids and padded fabrics thrown in. The knits will become fashion hits in five seconds flat. I don't fancy squeaking around town wearing JW vinyl, but I know a few girls who will. We look at the other wall (above) - oh how I love wall-gazing with designers! - and begin to ooh and ahh over his main visual inspiration the work of the stylist Joe McKenna and photographer David Sims. "Its the idea of conflicts,"he says, but as a fan-girl of their work myself, all I see is the beautifully off kilter intelligence of the imagery. It suits Jonathan. The spring summer collection of J.W Anderson is available at www.brownsfashion.com among others.